1. 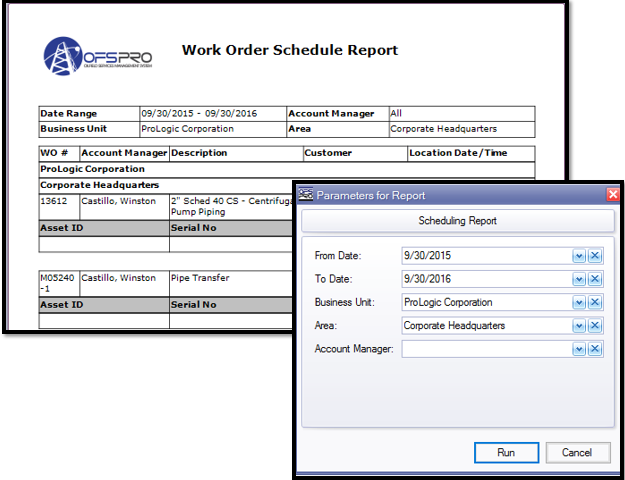 Double-click the Work Order Report in the window or press F9 to display the Parameters for Report window. From Date – Set to the current date by default. Choose another date from the calendar by clicking the (down arrow) button. To Date –Set to the current date by default. Choose another date from the calendar by clicking the (down arrow) button. Customer – Open a separate “Browse for Customer” window by clicking the ellipsis (ellipsis) button. 3. Click Run to run the report. Clear the Business Unit, Area, Account Manager or Customer fields by clicking the (X) button next to the respective field. To close the form without running a report, click Cancel. Copyright 2016 Webcreek Technology Inc.